What could my colleagues be doing? For weeks they have been shut up in their laboratories, emerging only for clandestine visits to the palace library. Could it be that they are also working on the king's puzzle? The fools! The formulas they research in the royal encyclopedia were written by me! 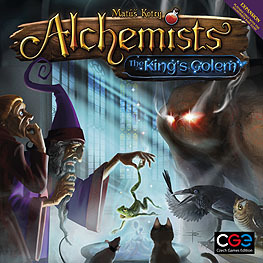 I am the one who knows the true nature of mandrake root, and I shall be the one who animates the king's golem! The Royal Encyclopaedia is a new venue for publishing your research. The Golem Project is a new deduction challenge. Can you bring a shapeless mass of clay to life?